It got eaten and people loved it but it really did test me on a few levels. Why?.. Well you asked. I struggle with a lack of self belief. Now I have said it, and I feel very brave. I don’t always believe that my abilities are unique or that I have any abilities at all. I am sure there are a lot of people like me. However, for a person with diminished self belief I love to create. It makes my world feel fulfilled and it makes me feel like I have done something for someone. Even so I am very shy about presenting these little gifts to people. Thank fully, I am surrounded by people who encourage me on a daily basis so I can overcome my doubts one day at at time. I am very eager to make people happy through food even when I have only hours to do it. A couple of days ago I was on my way out when I got a phone call asking if I would make a cake at short notice. It was for a person that I like a lot, and she had decided to throw herself a party. She is able to throw a fantastic party when she has the mind to, because she owns a bar in Marrickville. So, despite the fact that I was going to be out all night Friday and had planned to spend the whole day and night out on Saturday, I said I would squeeze it in for Sunday. Between Saturdays appointments and 6 pm Saturday night I shopped for ingredients. I packed them all into a box and headed out to my sisters house where we had planned to have dinner and a couple of glasses of wine while making an unusual attempt at relaxing. Instead I started the construction of this cake. She wanted a gluten free Carrot and Caramel Cake and I knew this was what she wanted even before she asked. I knew, not because I have any kind of mind power or ESP, it was just that she had gone mental for a cake I had made for another of my dearest friends, just recently. (cake below) The bottom layer was chocolate cake but the top layer was a gluten free carrot cake with caramel icing and she had gone bonkers for it. So, lets face it it was a forgone conclusion. Instead of relaxing at my sisters house, I turned her oven on and made a couple of cake layers. She’s only just moved into her house so the oven remained untested. I am pleased to report that it works. At the same time I had a number of glasses of wine as planned, cooked a BBQ and made an un-churned ice cream dessert for the next night so she could relax with her family and scoff ice cream . Yes, I was pretty tired on Sunday morning. (It could have been that last glass of wine). So after 2 headache tablets we ate breakfast together I packed up my cake layers and headed home to make caramel and construct a cake. Sounds quite simple except it was a 38 C day (100 F) and my house is at least 5-6 degrees hotter than the weather outside. A block of butter on the kitchen counter melted in around 10 minutes. It was easy to beat the butter cream icing but more difficult to keep it on the cake. I made a cream cheese based buttercream so that it would have more solid body. It took a very long time to get the four layered cake chilled. The party started after 5 pm and would run till the wee hours but I had hoped that I would be able to get it to it’s destination before too many people crowded into the bar. I left home with the well chilled cake in a pre-chilled car at 7.30 pm. 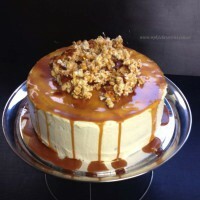 This cake has a dripping caramel layer and the caramel that needs to be just warm when poured over a chilled buttercream. Yes, things were not quite as controlled as I would normally like them, but this isn’t the worst part of the story by far. When I pulled up there were a lot of people sitting outside the bar and there was a band on the stage on the makeshift platform right in the doorway. I began to doubt myself . I had been told it was a private party and we could enter the bar via a back lane, but with people sitting outside I began to think I had misheard the day and as I parked the car some distance away I doubted myself. Had I misheard, why had I not double checked the invite she had sent, had I made the cake on the wrong day. Would I have a puddle of cream cheese on the floor of my car? I was so over myself. I know it is stupid but this is a big and heavy cake . You can’t just go waltzing down the main street with it, it needs plans all of it’s own. And when you doubt yourself everything looks scary. Unable to leave it in the car and ask questions I picked it up and started walking down the street. A small round boy of about 5 looked up at the cake in my hands and stared till his father called him. He tore his eyes off the caramel popcorn and moved on. That was a little piece of comedy I appreciated in my time of duress. When I got to the bar there were 3 ladies sitting outside at a table with a spare chair. So, I sat down and put the cake on the table dwarfing their drinks and stopping their conversation. “Are you at Fiona’s party?” I asked. After the surprise of having a big caramel cake at their table subsided a little, they told me there was a private party out the back and that I should just walk through the bar and out to the courtyard of the bar. “I can’t push my way through a bar with this cake”. I said in disbelief or maybe it was fear. On one hand I felt relieved that I had the right day and on the other I felt mortified that I would have to struggle my way through a bar, past the band and through a tightly packed room full of people. By this time a nice man had stepped up and was telling me that all I needed to do was hold it above my head and yell, ” coming through!”. He must have seen the look on my face because he very kindly asked “Do you want me to carry it for you?” I could have kissed him. 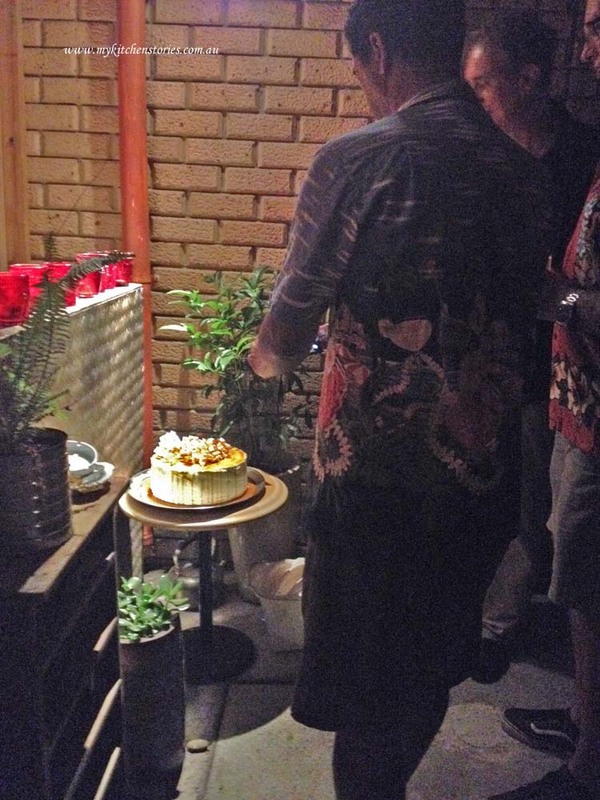 He promptly took the cake from me and into the bar where he held it high and danced his way past the crowd who cheered and whooped and craned to get a better look at the cake flying by. He pushed through this crowd and out the back and through the next lot that just as enthusiastically cheered the arrival of the cake. Sure every one was starring and asking questions but I was so relieved to be here, with the cake, only slightly covered in cream cheese icing. So without further ado here’s the recipe . I have no comment on my own stupidity. Grate the carrot and then toss with the dry ingredients- you can use your hands to do this it works best. Pour the egg mixture into the dry ingredients and carrot and mix well. This is where you will decide how many layers you are making from each mixture. You can divide this mix in half for thinner layers and make another mixture to divide in half for 4, or simply make this into 1 delicious cake. Pour into the paper lined and greased cake tin and bake for approximately 40- 50 minutes for each layer. Check that the middle of the cake is cooked by piecing it with a skewer or knife. The tip needs to come out clean. I like to cool each layer and refrigerate. Separate 1/4 of this for the inside layers. You can add a little more powdered sugar to this mixture or even caramel extract if you like. * Note the more sugar you add the softer it will become. Temperature will also play a part in the amount of sugar you might like to use. The hotter it is the less you will need. Put the sugar into a pot with the tablespoon of water. Cook on high swirling a little to incorporate all the sugar. Cook till starting to colour watch very carefully and turn off the heat when it is a golden brown colour. Add the cream immediately, stand back it will splutter. 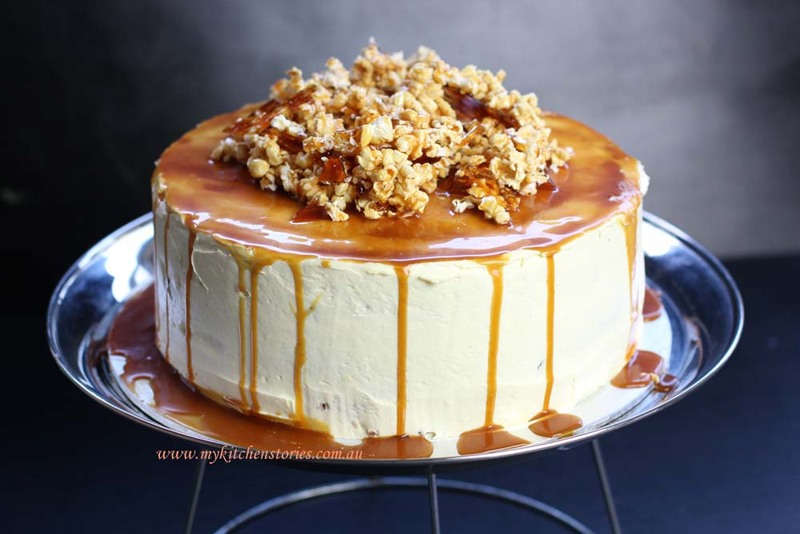 Break up the butter and whisk into the caramel mix. Add the salt 1/2 at a time, and let it dissolve before adding more to taste . If your caramel forms a skin and is very set then add a tablespoon of water and stir till it mixes in. When only just warm pour 1/2 to 3/4 over the top of the cake and tilt so that it spreads. It will keep running for a while so put onto a tray and back into the fridge to set. 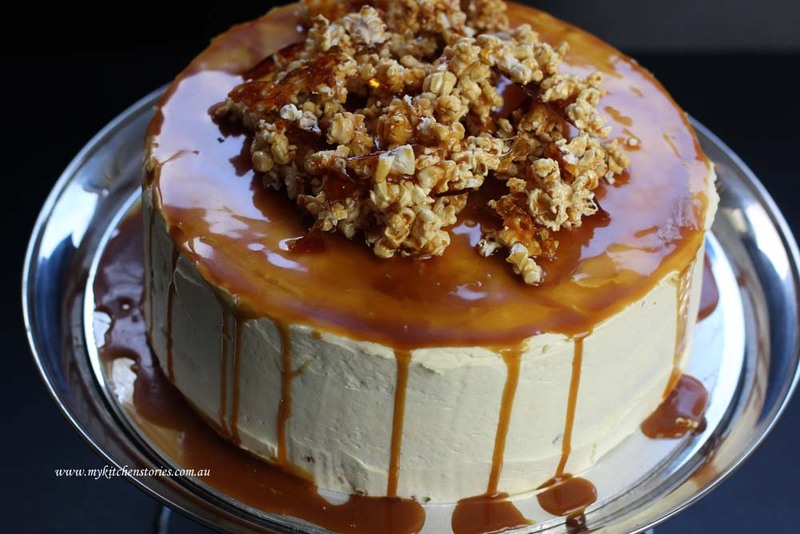 The caramel will not be spreadable with a spatula, so you may need extra poured in spots to fill the gaps. Put the sugar and glucose into a pot with the water and the lemon juice. Heat till the sugar dissolves swirling to incorporate the sugar crystals at the sides. Cook on high till the colour starts to change to a golden colour. Put the popcorn into the pot give it a quick mix and pour onto the tray, spreading with a wooden spoon. Alternatively pour the hot syrup over the popcorn on the tray, moving the popcorn about to get covered with a little praline. ** be very careful with this hot liquid. Once caramel is on the popcorn let it cool completely before touching! This cake is very moist. it will have a soft centre right up until the last minutes of cooking. It takes a good 60 minutes to completely cook through. It will cook through!!! !Cream Cheese Frosting- The recipe above will make enough for a small to medium cake. !for a single or 2 tiered cake this will be enough for the layers and the outside. Great story and a beautiful cake! I’d say very well done. 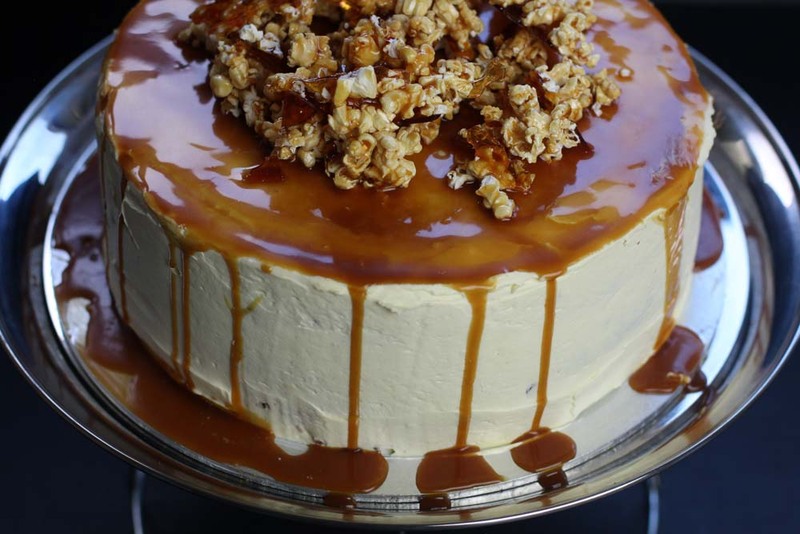 I made a carrot cake with this weeks Sunday afternoon treat, but Oh my yours looks so much better than mine… I love the caramel popcorn… stunning! 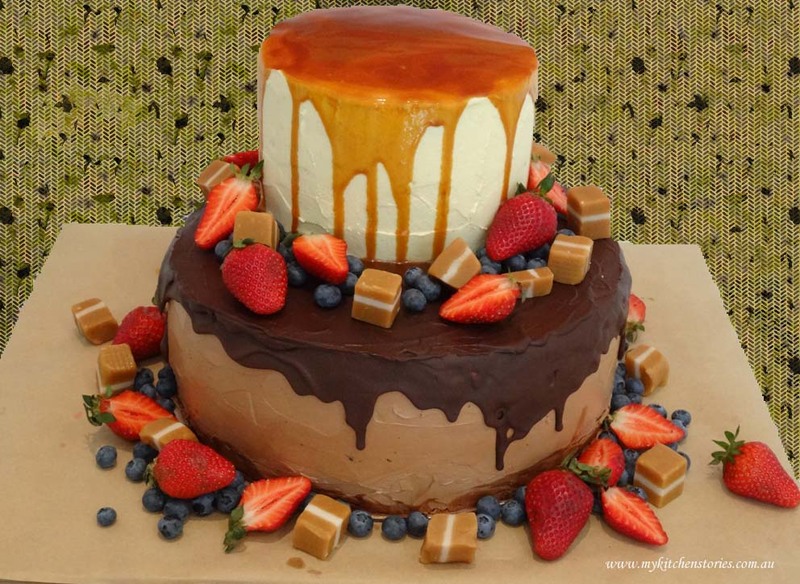 This cake looks absolutely beautiful – one of the most stunning you have made. I know what you mean about baking in this weather. I had to make a batch of cupcakes and the butter became almost liquid…not to mention my hotter than hot kitchen. Maybe you could print out copies of all of your wonderful cakes – and there have been many – make them into a collage or a poster and frame it! You will see that you are a very talented baker! What a decadent and beautiful cake! That caramel sauce is simply irresistible. That is one heck of an outstanding cake… and from the introductory story, you are a better woman than I am! I was brought up being told I wasn’t good enough and then promptly married someone who told me I wasn’t good enough so I do understand. Your cooking is outstanding, your personality is delightful and I wish we lived closer so we could spend more time together. I love this cake!!! The cake looks amazing Tania as does the double layer one! Don’t worry you’re not the only one who doubts yourself. I start freaking out when I have to serve anything to more than a couple of people. You did a wonderful job! I just love the look of that drizzle! Yum! Sounds like a mix of a few cake incidents that I’ve had recently (baked eight cakes this past Saturday-big mistake!) all rolled into one. Thank goodness for the man who carried it through. Often cake makers say the biggest challenge is transporting the damn things. I’m glad everything turned out okay with the cake. It’s really gorgeous! I hope that your confidence is boosted by this, because it is more than deserved. Keep baking, keep giving and you will learn that you are fabulous! This cake is stunning, simply stunning. 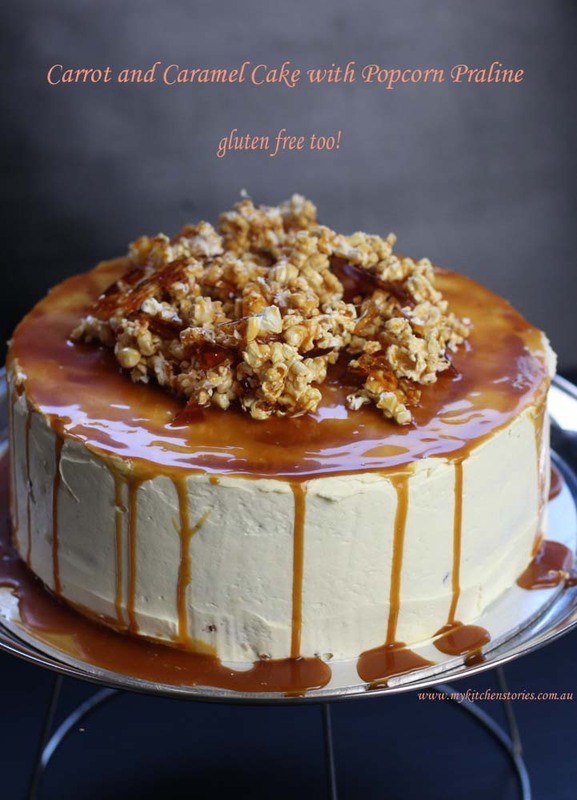 I absolutely adore carrot cake so I’ll definitely be bookmarking this recipe for my birthday in March. Thank you! Wonderful story. I giggled and giggled. I adore the story of getting the cake through the bar and I adore the sound of this beautiful cake. I love that you gave the details of a gluten-rich version too. Some of the best, simplest advice that I have ever received is, “Just do you”. I think you’re doing you very well! This is a beautiful cake with such a unique twist on the average carrot cake. Brava! Ahh the cake carrying knight in shining armour. Cake looks amazing and sounds absolutely delicious. This cake looks absolutely stunning! Looks so scrumptious, too!